This article explains about the how to create a WCF service with transaction enabled. Refer “Transaction Mode” article to learn more about the server side and client side transaction mode. Modify the service application to throw exception explicitly after successfully insert statement execution and check the transaction behavior. Step 1:Create the Employee service that allows the addition of new employee details in DB. Decorate the operation contract with TransactionFlow attribute for enabling the transaction. TransactionFlowOption take three set of values. Step 2:Create the service class which implements the service contract and set the operation behavior with TransactionScopeRequired = true . This attribute is used to enable the service transaction when the client transaction is not available. Step 3:Update the service endpoint to enable transactions for wsHttpBinding by setting the transactionFlow attribute to true. Setting transactionFlow at config level doesn’t mean that the service wants to use the client’s transaction in every operation. It is required to set the transaction at the service contract level as mention in Step 1. 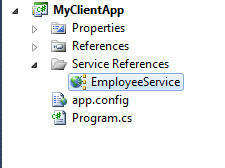 Step 5:Create a new proxy object for the employee service and call the AddEmployee method. Step 7:Run the client application and check the output. Result clearly says that even insert statement is executed successfully and error is thrown after insert statement, DB is not updated. Because all the code execution is comes under the transaction so failure in any module of code will revert back all code execution.